Villains 2 Vinylmation were released a few days early today at the Disney Store at South Coast Plaza Mall in Costa Mesa, CA in honor of an artist signing event! I don’t know if you guys know this but, yours truly recently got a job working at the Disney Store in South Coast Plaza (if you are in the area come visit!) 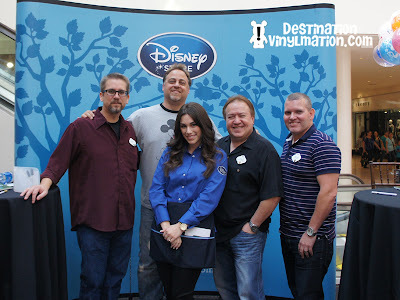 I was asked to work this event since I have such extensive Vinylmation knowledge! I obviously said YES! I can’t wait to tell you guys about my day! I got into work around 9 am and there was a huge line of eager and familiar Vinylmation fans waiting to get their hands on the early release of the Villains 2 blind boxes as well as the LE 9 Inch Combo of Jafar and Genie! Many guests told me they got in line around 7 AM, and actually got to sleep in! 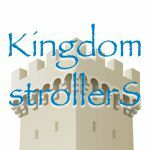 (Which we all know is rare with limited releases!) We started ringing customers around 9:30 and got everyone queued up for our event starting at 10:30! 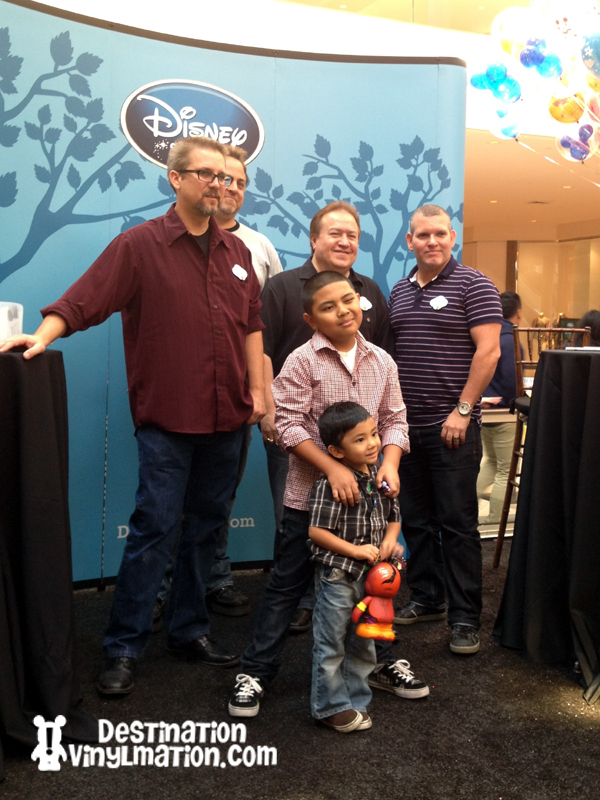 The artists that were on hand at the event today were, Jim Valeri, Gerald Mendez, Enrique Pita and Kyle Jensen! All artists worked on series such as, Villains 1, Villains 2, Robots, and Certain city specific Vinylmation as well as Lion King. 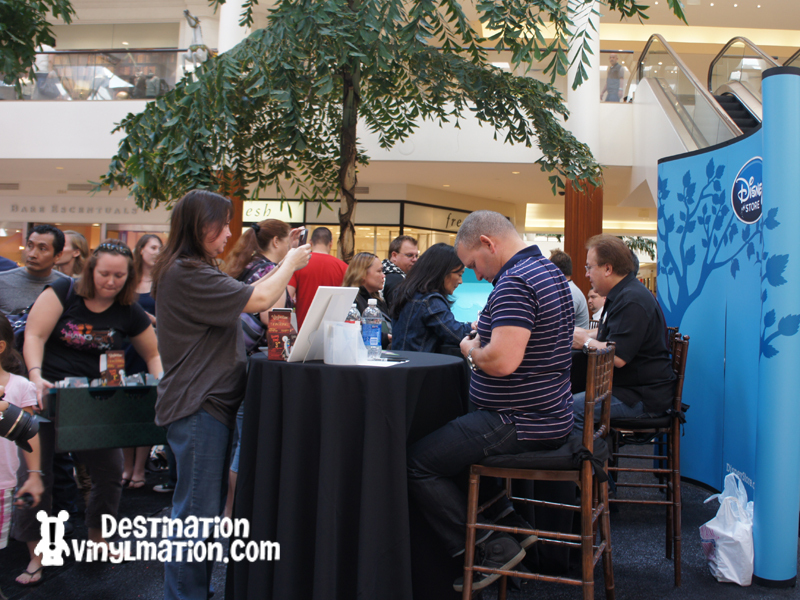 Guests were so excited to meet the artists and get their Vinylmation signed! 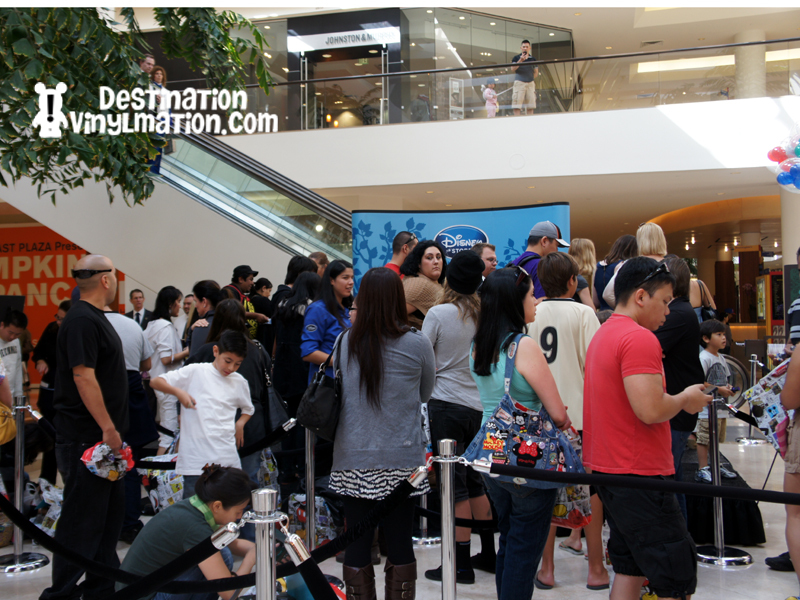 Sadly around 10:45 we sold out of all Villains 2 Vinylmation, but luckily we had plenty of Lion King and Robots to go around! The artists seemed to be having such a blast with the fans! 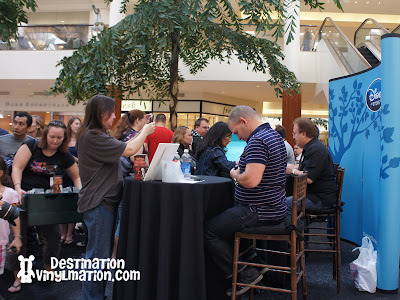 I worked line control so I was interacting with each guest before they would enter the signing area! Everyone seemed eager and really excited about the series! 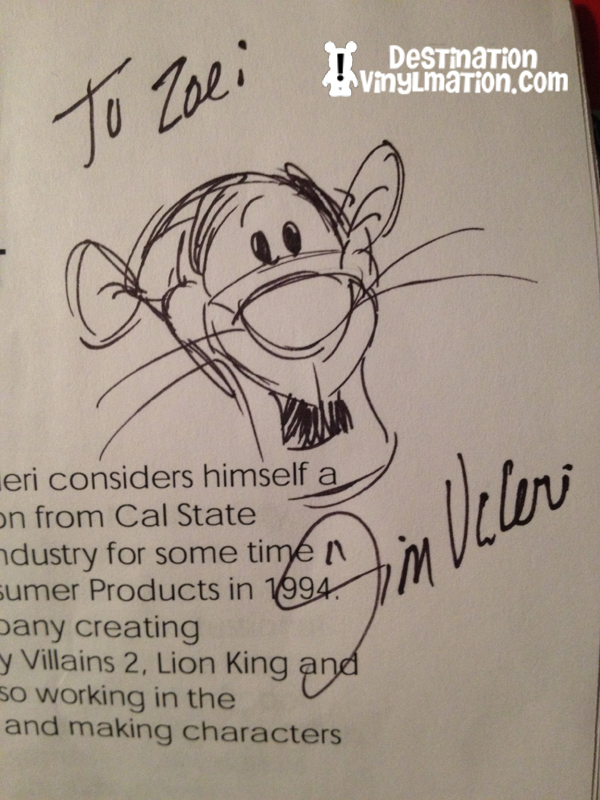 While chatting with guests before the signing began we found out that so far there is, one variant in Villains 2, which is Shere Khan from Jungle Book. 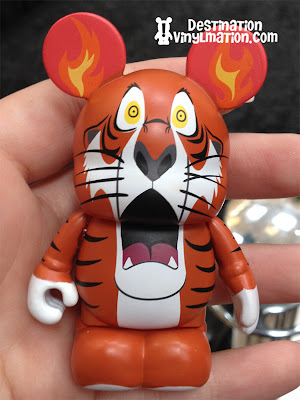 The regular Shere Khan has green ears and the variant Shere Khan has flames in his ears! I love this variant. I think that Kyle did an awesome job on these two! I noticed that Jim took the time to draw little sketches on some guest’s items. On one guests tray he drew Goofy! so on some down time I asked him to draw me something! I asked him to draw anything he wanted and he chose Tigger! I love it – he is so talented and funny! Thank you for being so great Jim! 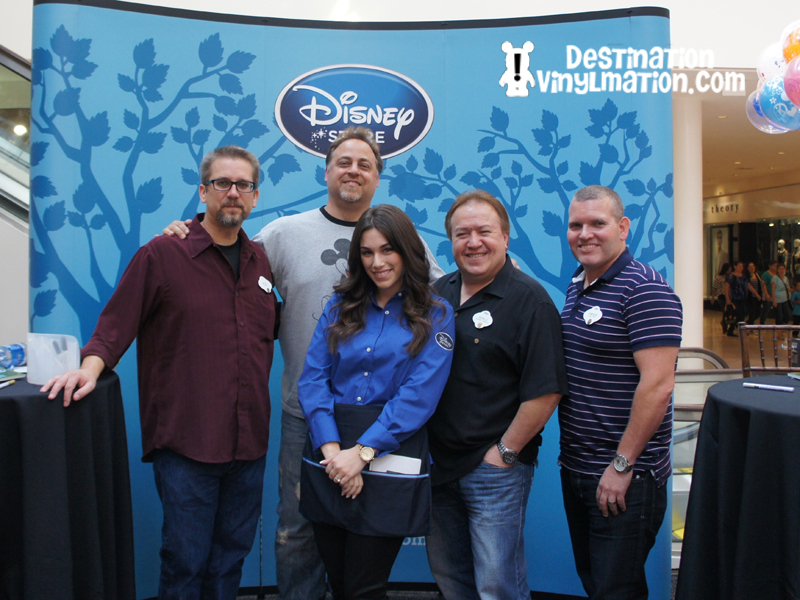 After the signing came to an end, Radio Disney who was on hand for the event gave away, one full tray of Vinylmation Villains 2 as well as the LE Jafar & Genie. 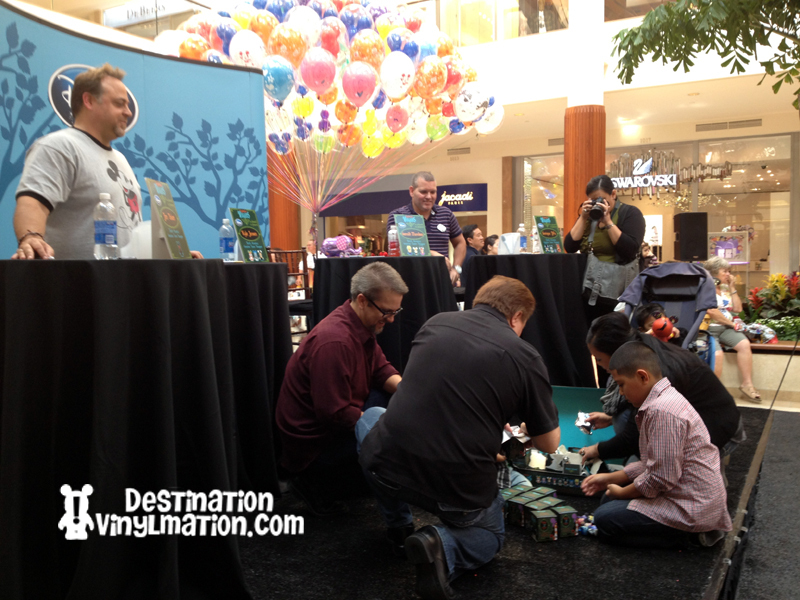 The lucky winner was a young boy and his brother who were SO excited about the set! 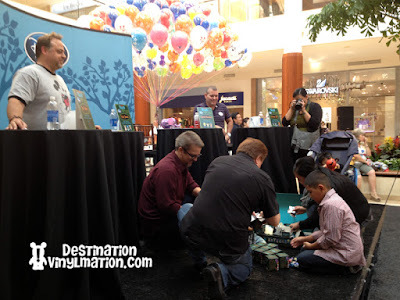 The artists were so excited they even got down on the floor with the winner and helped him open up his blind boxes! How cool is that! After everyone starting clearing out when the event was over the artists all gathered on the stage to take a photo! You guys can obviously see that today was a lot of fun and I’m so glad that we had such a great turn out! Fans were excited, the artists were happy and the set turned out AMAZING! Looks even better in person I promise! I can’t wait to go pick some up on Monday October 24th when they are released at the Disney Store! Don’t forget if you guys couldn’t make it to the event, the Villains 2 series as well as the 9 inch combo will be online starting Monday October 24th! Zomg.. Zoe. i saw you. i knew it was you right away.. but too shy to say hi. we were one of the last few ppl that were able to get things signed.. since they closed the line early. Thanks fror the great post. I have a question though before the series is officially released tomorrow. How much were the Villains #2 blind boxes selling for, and subsequently, a sealed tray??? Because I have been hearing some conflicting reports and would like to know for sure. Thanks. My wife and I went to the signing event at South Coast Plaza’s Disney store and by far the best run Disney event we’ve gone to in some time. Hats off to Mark and the rest of the Disney staff. They kept us all well informed and even got us in a little earlier than the time specified. Great job. Wow…didn’t realize I was talking to a celebrity. Great meeting you and great article. Say hey to LC next time she’s around!